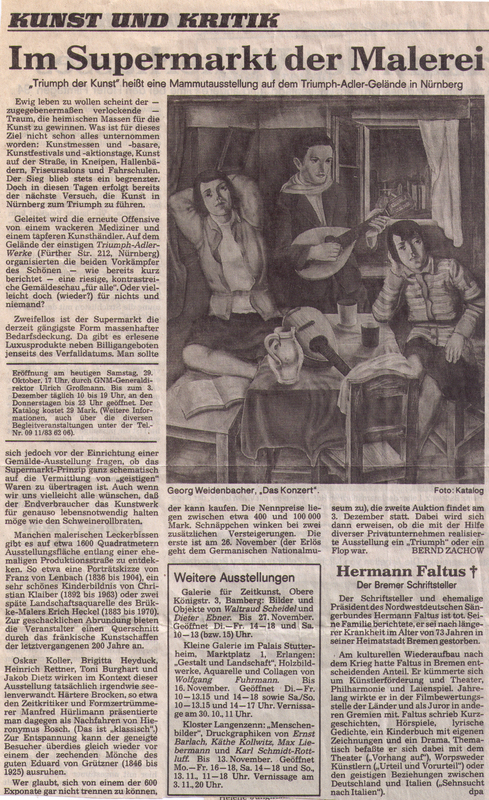 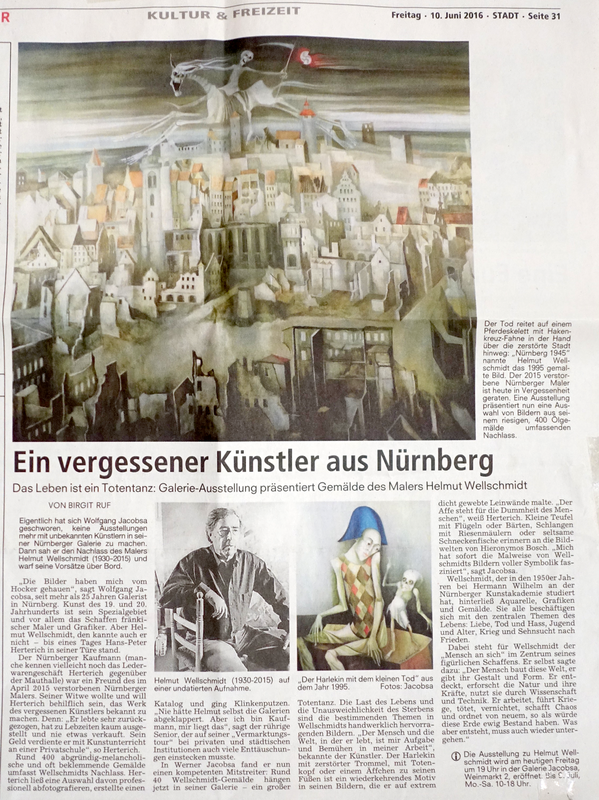 "A Forgotten Artist from Nuremberg - Life is a dance with the death: Gallery exhibition presents paintings by the painter Helmut Wellschmidt"
"Salvation for unrecognized Ritter - art historian wants to move artists from the 19th century back into view"
"Walks through the old Nuremberg gallery Jacobsa shows for the most part unsaleable paintings from the Norika collection by Manfred Grieb"
"Here are mysterious beings - abduction into fantastic worlds: Jo Niklaus and Wolfgang Harms exhibit at Galerie Jacobsa"
"Much durer also in the galleries. 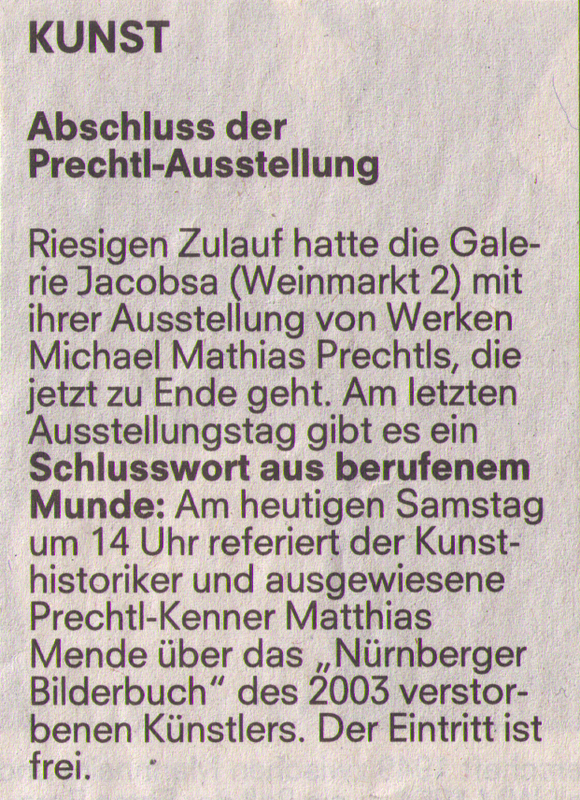 Various exhibitions address the master"
"End of the Prechtls exhibition with a final statement by the well-known Prechtl expert Matthias Mende"
"Prechtl's view of Nuremberg. 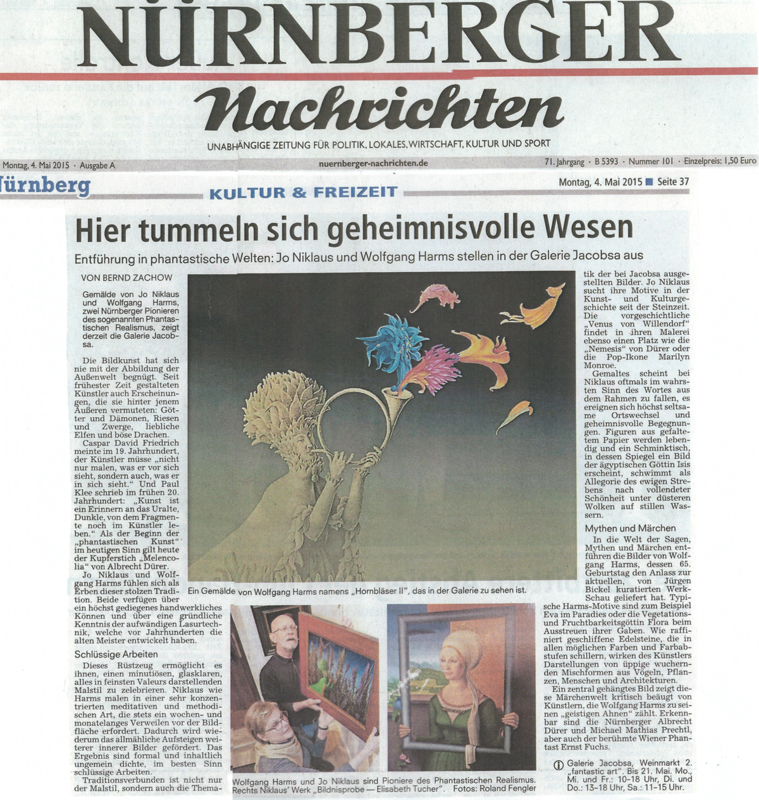 Paintings, graphics and ceramics in a gallery exhibition"
"Hans Sachs fits his muse boots - a look at Prechtl's Nuremberg picture book"
"Michael Mathias Prechtl's Nuremberg picture book"
"Old master and wrongly forgotten. 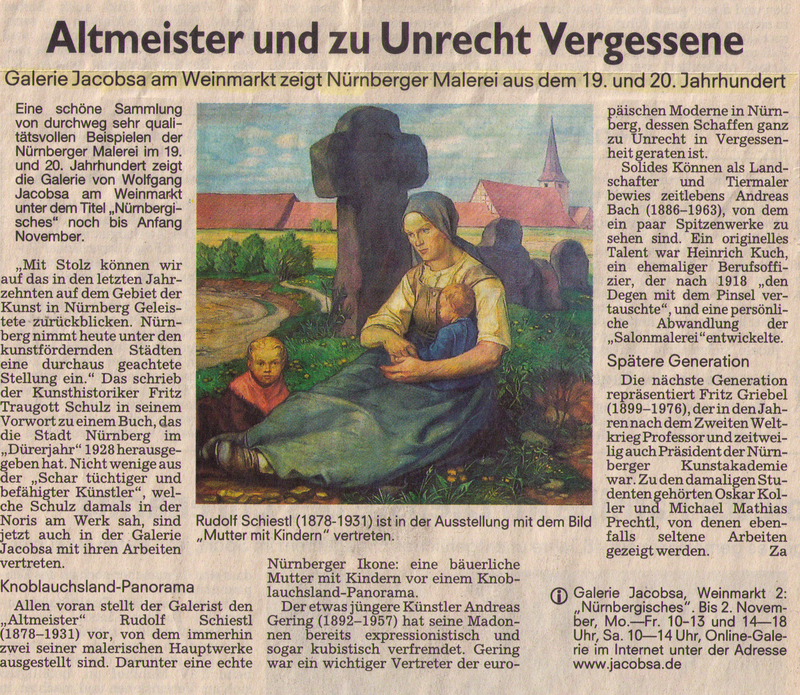 Galerie Jacobsa at Weinmarkt shows Nuremberg paintings from the 19th and 20th centuries"
"In the supermarket of painting. 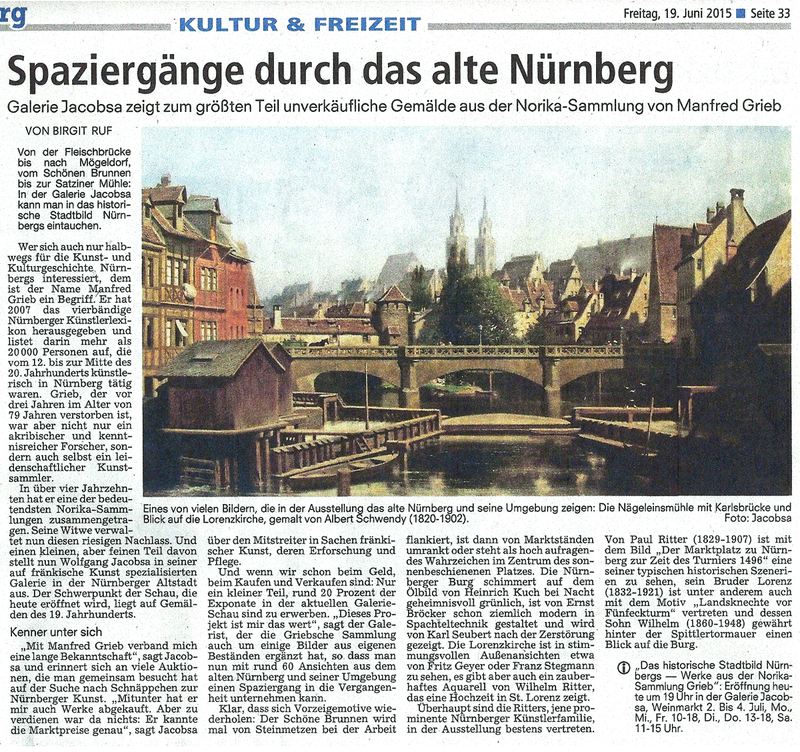 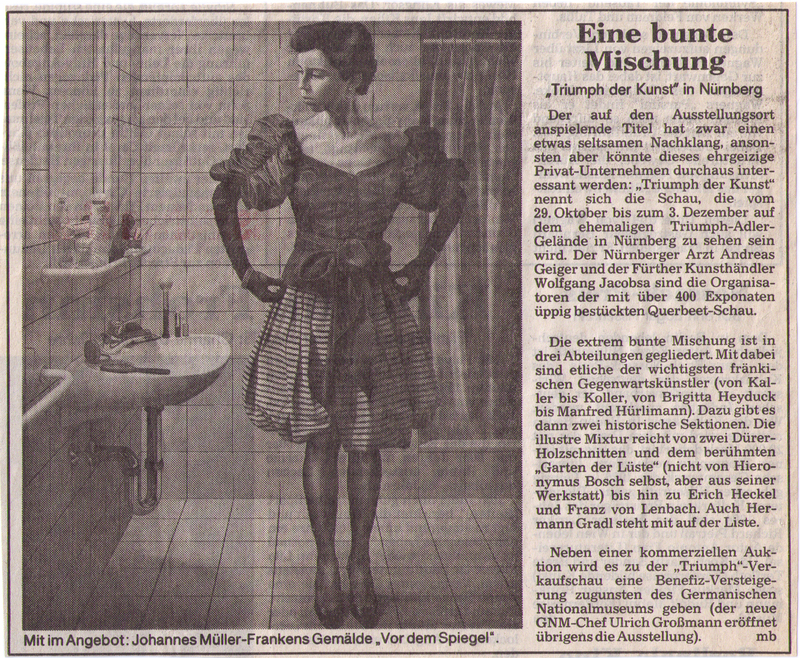 "Triumph der Kunst" is a mammoth exhibition on the Triumph-Adler-grounds in Nuremberg"
"A colorful mixture "triumph of art" in Nuremberg"
"Inventive painters - pictures by Heinrich Kuch prove his interest in technology. 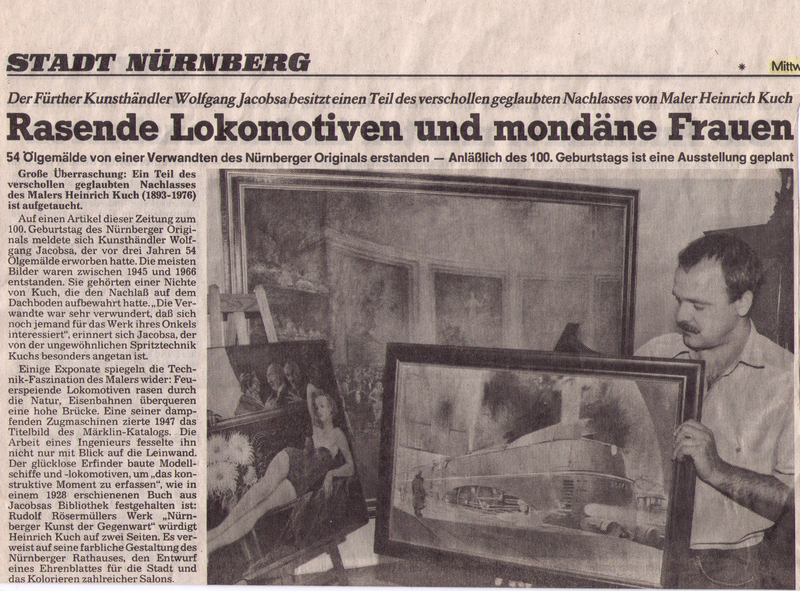 40 of his paintings are to be seen in the exhibition "Triumph of Art""
"Furious locomotives and fashionable women. 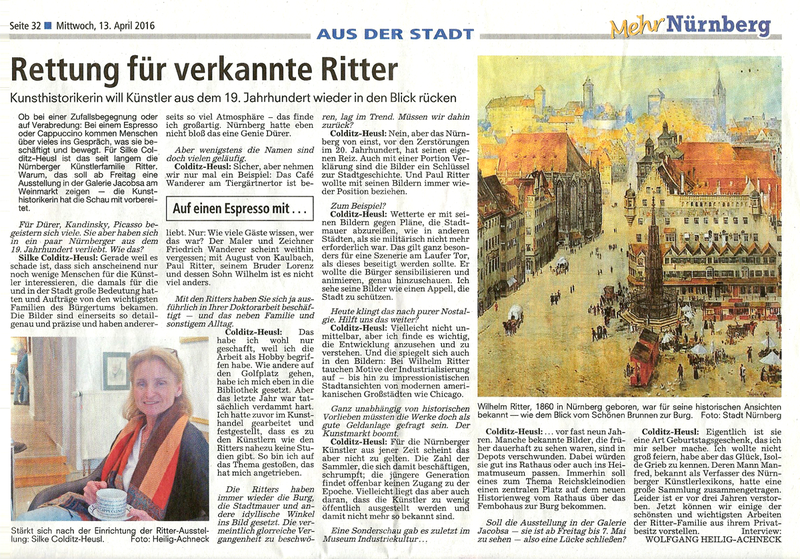 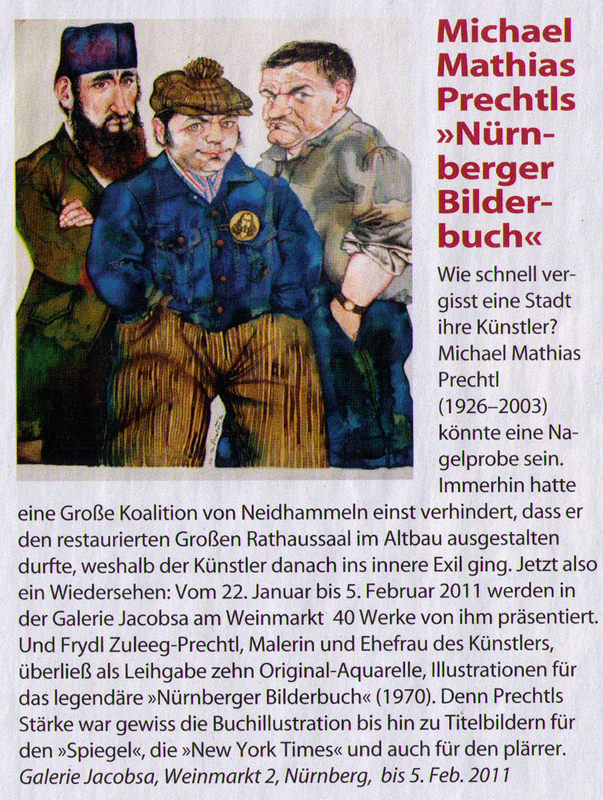 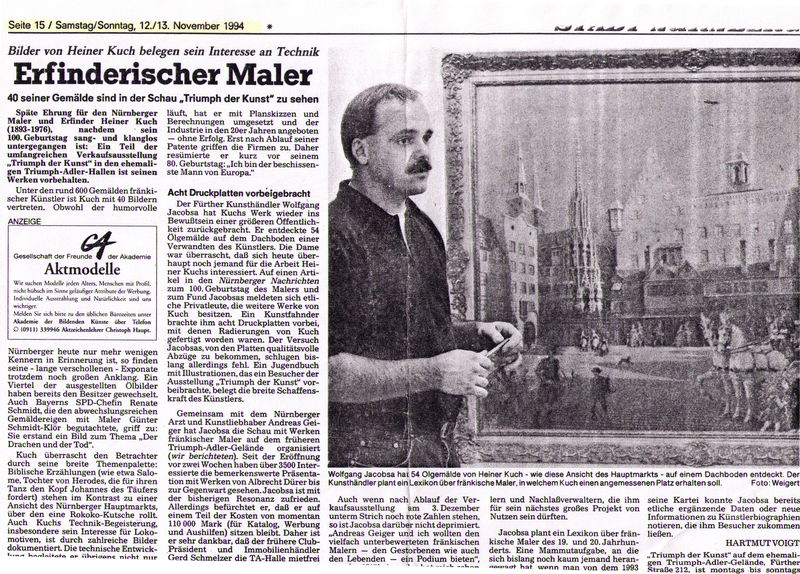 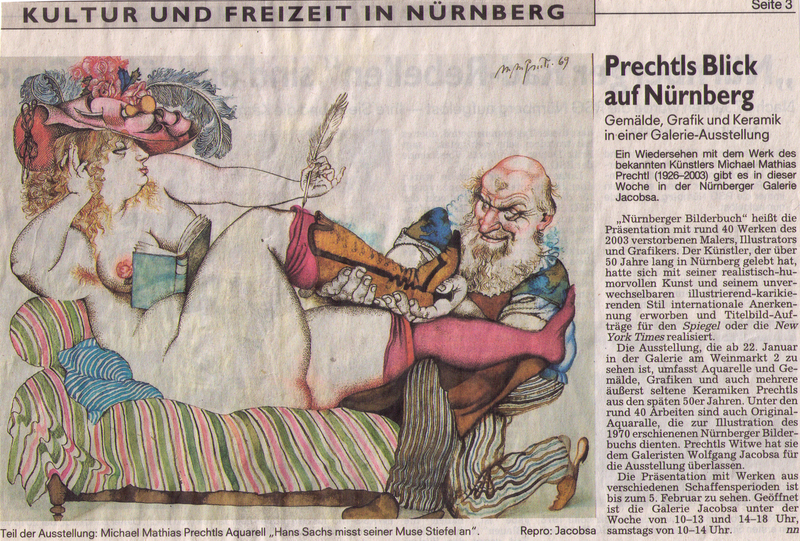 The Fürth art dealer Wolfgang Jacobsa owns a part of the lost legacy of painter Heinrich Kuch"